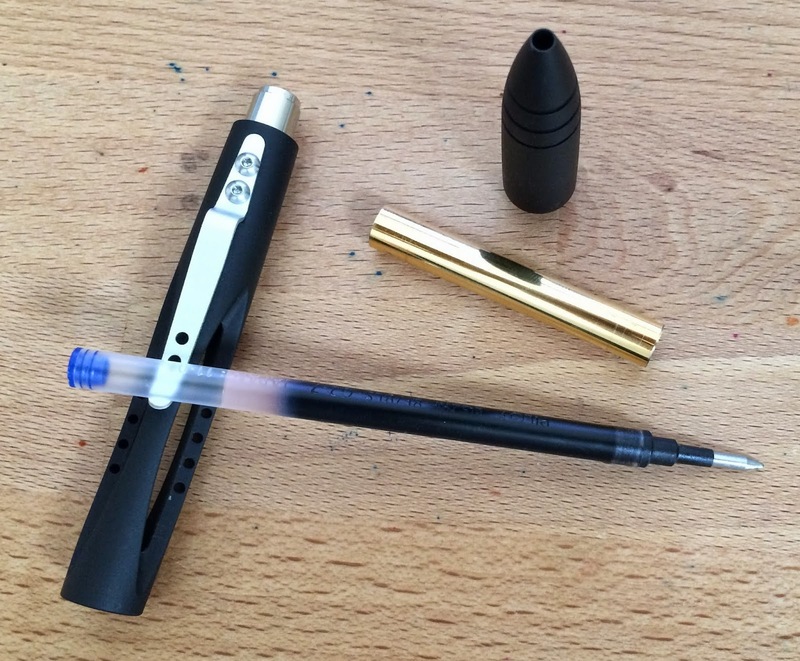 Kickstart the Airfoil Click Pen by Masterstroke | Inkdependence! I'm glad that I saw this pen on someone's Instagram, and I'm really glad that Grant (the man behind Masterstroke) happened to see my comment about how rad the pen looked. He was kind enough to send me a prototype pen to play with and review. There are fingerprints in the photo above. Please don't use futuristic tech to reproduce my fingerprints and rob banks, leaving my prints behind instead of yours. That'd be rude. The new Airfoil Click is an improvement on the original Airfoil, I think. The original pen was much more obviously air-frame inspired, and the fins seem like they would have been uncomfortable to use for very long. In contrast, the new Airfoil Click sports only three ribs, and they're broader and smoother than the original design. The ribs that you'll see below are broad, and they have a rounded edge. Pretty comfortable, I think. Also gone is the twist mechanism. Apparently people were clamoring for a click-version of the pen that would accommodate a gel or rollerball refill. Grant sent me a Schmidt rollerball, but I've been using a G2 refill in it, and it works really well. There's no tip-rattle on this pen, and I really appreciate that. 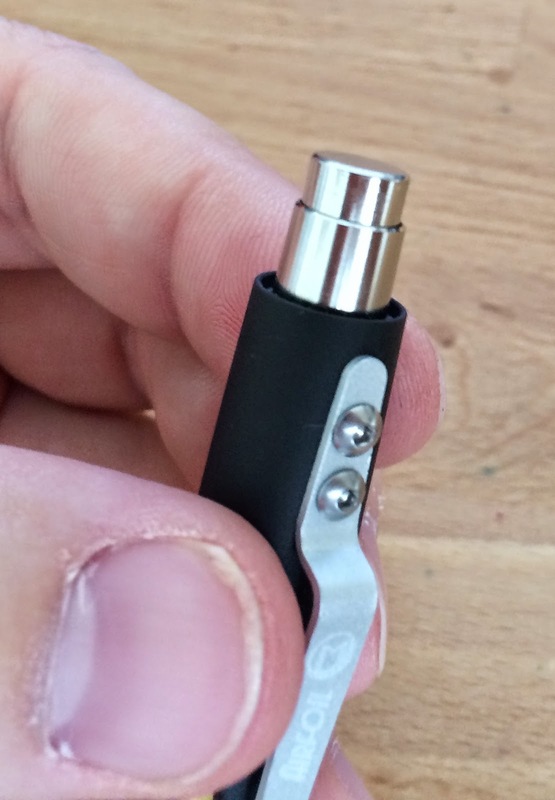 This picture is from the Kickstarter page for this pen. The knock used is the same as the one found in the Retrakt and some other pens you might have seen on Kickstarter. It's a good knock with a smooth, quiet action. For some, that action is going to lack the satisfaction of a solid click. The picture below shows that knock in the depressed-stage. It's a handsome bit of hardware, I think. The version that I have is the matte black anodized model with an aluminium clip, sliver knock, and a brass-colored tube in the center. You can see a raw aluminum one here, and here, a glossy black here. My matte black is really nicely finished. Everytime I've used this one in public someone comments on the pen. They're surprised by the weight of the pen, and almost everyone has found it to be comfortable to use. Most of the weight is down near the tip, so your hand doesn't actually have to bear that weight when you write with it. That's the proper balance, if you ask me. The only problem with this pen is that the clip is aluminum. It's a little to soft and likely to bend, for me. for an extra dollar, you can get a stainless steel version, and that one will be way better. A bomb-proof pen like this one needs a bomb-proof clip, I think. 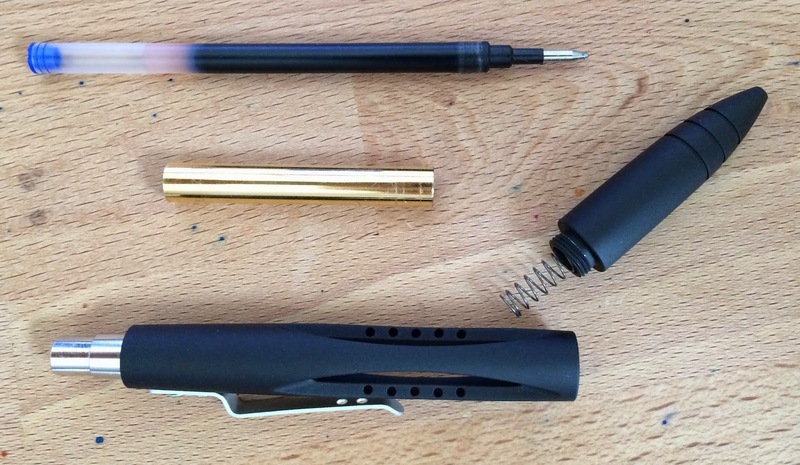 Here's all the parts of the pen, taken apart. 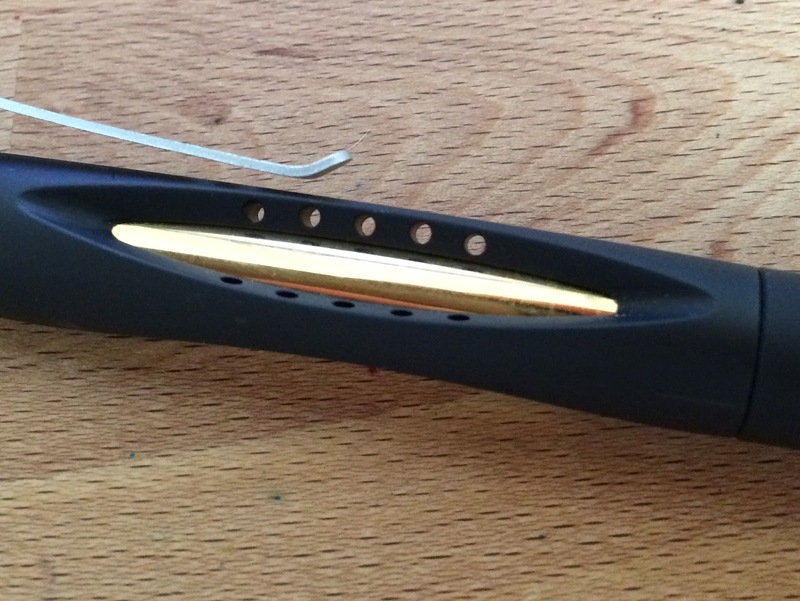 A close-up of the clip with the "Airfoil" and brand lasered into the metal. Long story short, I like this aerospace-inspired pen. It's got a great design that will appeal to lots of folks who want a technical or tactical look to their hardware, and it's likely to please those who want some weight to their writing instruments. It's also manufactured really well, without any gaps or loose parts. Check out the kickstarter (for the next 8 days) at this link. Great review! Great photos too! The video gave a really good 360 view of the pen, something I had been looking for. I think the matte black stands out to be my favourite finish so far - the textural contrast of the black with the brass shim is classy. I just backed the pen today and am investigating which finish to choose. Thanks, Bi. I actually took those photos with my iPhone 5s because my camera's SD card went to work with my wife. I'm glad they turned out well!